With the theme “Converging tourism initiatives towards inclusive and sustainable tourism development," the Department of Tourism - Region 12 headed by Regional Director Nelly Dillera is now busy preparing for the Tourism Week celebration set this coming September 25- 28. To be held at the Activity Center of Veranza and the KCC Convention and Event Center in General Santos City, the Tourism Week celebration will have activities like the Travel, Trade and Services Fair, and the Tourism Skills Demonstrations which will showcase bar tending, table napkin folding, fruit and vegetable carving and many others. The Region 12 Tourism Summit will be also held to present different DOT convergence ventures with other government agencies and receive project proposals for tourism development from different LGUs in the region. The launching of the region's new tourism brand - "The 12th Paradise, Region 12, Philippines" will highlight the Tourism Week. 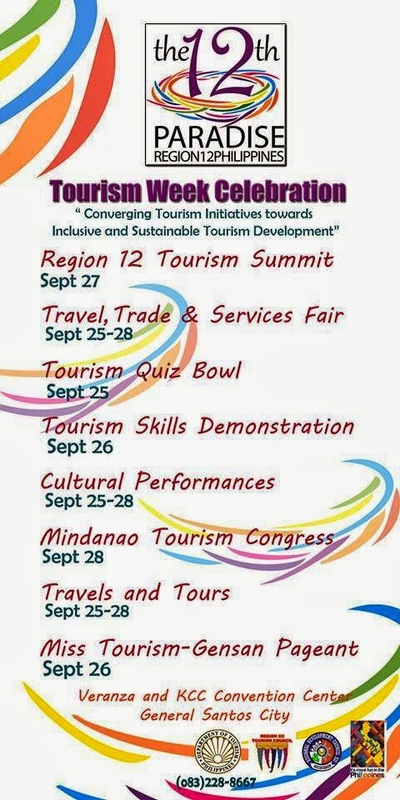 Other activities for the Tourism Week are the tourism quiz bowl, Cultural Performances, Travel and Tours, Miss Tourism -Gensan Pageant and the Mindanao Tourism Congress.